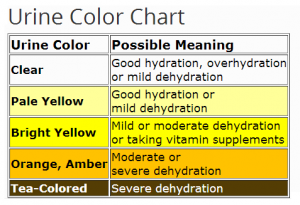 NOTE: The above urine chart can only give you an idea how the urine color can change in dehydration, but it is NOT a reliable tool to judge in which stage of dehydration you are. EXAMPLE: You are walking in a hot summer for several hours without drinking; during this time you’ve lost 4 kilograms and your urine is dark yellow, which means you are probably moderately dehydrated. Then, within 30 minutes, you drink 2 liters of water and soon after you excrete 300 mL of clear urine, which may make you think you are well hydrated, but you still lack 2.3 liters of water, so you are still at least mildly dehydrated. 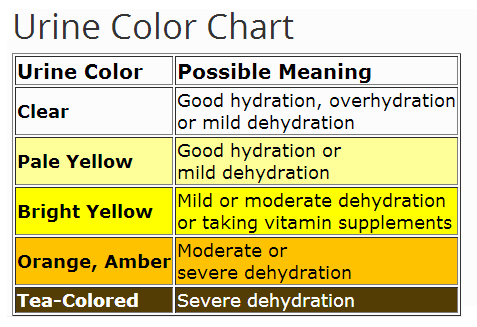 This is an example when clear urine does not necessarily mean good hydration. They are a sudden loss of body weight, decreased skin elasticity and other symptoms and signs that can tell you how dehydrated you are. Check the difference between dark and cloudy urine. For 4 months, my urine has not been clear, it is either brownish yellow, or orange yellow, pls what does this signify. Emma, it can be dehydration, some food or beverage with strong artificial color, vitamin B supplements, or urinary tract infection.